Only a few days until the Oscars! Imagine being the publicist of a secret band! At some point, you know the secret’s going to come out. And of course with Plebeian, it did. Lynette, Plebeian’s publicist, used to work in the marketing department at the fictional Riverside Resort, along with our main character Lauren. She and Lauren have a history, which is revealed a bit more in book 2. But one thing that is clear in book 1: Lauren trusts her. During one of Lauren’s difficult times, Lynette works day and night to manage an impossible situation, and she never leaves Lauren’s side. She also deploys some clever tricks, especially when she rewards a photographer that would later reward Lauren. And she has the very difficult task of delivering horrible news to a curious world. I mused Lynette after a friend; a friend who works in PR. I tried to capture my friend’s fun and feisty spirit, along with her professionalism. I also stole two of her real attributes: her first name and also her love of Cheetos. The fictional Lynette loves cheese puffs too, only the fictional Lynette goes a step further and dunks them in sour cream. Ick or yum? Oh that Andy...such a romantic! So true! One of my favorite lines of Plebeian Revealed. Everyone needs a best friend, right? And Lauren, the main character of PLEBEIAN REVEALED, sure has a best friend in Christy. Christy has been Lauren’s friend since high school. She’s full of life, with long, curly copper-brown hair, and she’s eager to be helpful. Maybe, too helpful. At Plebeian’s inaugural concert, Christy has filled her block of tickets with some old friends from high school. Christy makes darn sure that one of those old friends, Andy Hayden, gets face-to-face with Lauren following the show. While Andy and Lauren catch up, Christy does what a good wingman (or wingwoman) does: she keeps Lauren’s husband Cory distracted. But even good intentions from a best friend can sometimes backfire. And Lauren’s told Christy a million times she doesn’t like surprises. But Christy can’t resist. Goodreads is a wonderful online community of book sharing and reviewing. 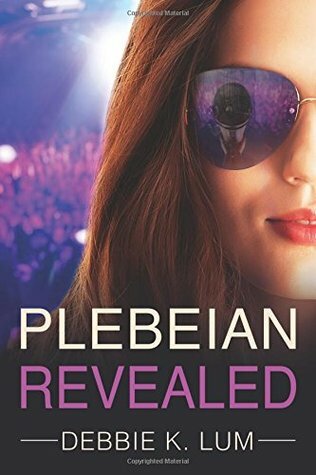 And for two weeks, you can enter for a chance to win a free copy of PLEBEIAN REVEALED.